One of my goals for the summer is to sort the fabric boxes. Just sorting them is not enough of an incentive for me to actually do it, however, so it's taken the completion of another project which would benefit from sorted fabric for me to want to get them done. The first step is to get the table in the living room cleaned off so there is some work surface on which to make piles. The first step of that mega-step was clearing off the papers I tend to just pile until I feel like dealing with them. Step 2 was the CD's, which I handled. That left a large, cleared surface just waiting for something to be stacked on it. There is, in any project in my home, an invisible step that goes, "And remove the cat from ... " With her, it's easy to do. I get out the comb and start combing. She's got small mats near her tail so I work on one or two of them until she gets angry and then she leaves and I get my table back. 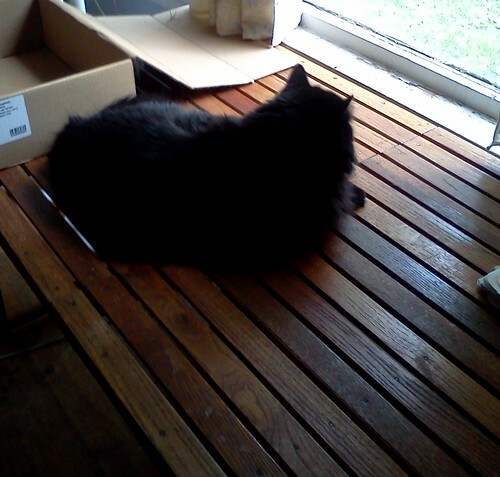 She also gets sleek fur even if she doesn't really appreciate it. The first box to sort is a box I brought back from Iowa in March. Mom is cleaning and she makes boxes of stuff for each of us to sort through. When we visit, we go through at least one box and we "oooh, yes" or "well, no" to the items contained therein. This box had a few things on top of fabric. One of them, I'd seen before but it was set aside. Now, it's in my house. See these? 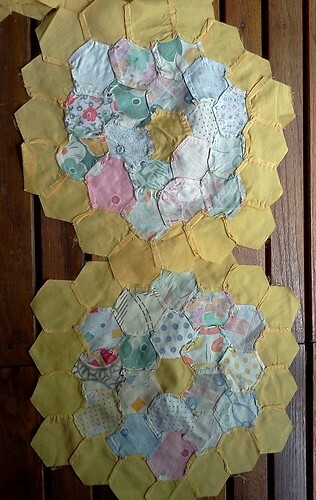 These large hexagons made up of small hexagons were to be a quilt top. My great Aunt Tillie and probably my grandmother and her sister, Irene, as well as unnamed female relatives on my grandmother's side of the family made these. We think they did this during the Great Depression. My mother was cleaning out her mom's house after Gram passed away and found a bag with these hexagons in them. She doesn't remember ever seeing Gram work on them so they have to predate 1937. Here's the back of a couple. These appear to be hand sewn together, although it is possible someone had a treadle machine and sewed the yellow borders onto the patterned hexagon. 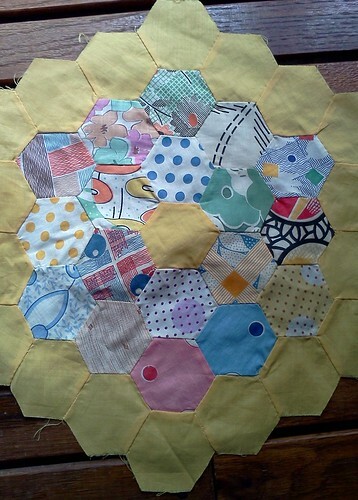 Here's a close up of one of the hexagons. You want to talk vintage fabric, have I got vintage for you. Quilts were made of fabric saved from worn out clothing. Fabric cost a lot and was just out of reach of so many people during this time. If you were able to get a hunk of fabric, you used every single inch of it. I can't imagine, although it is possible, that the women of my family went to the fabric store and purchased fabric, beyond the yellow, for a quilt. So, this leaves me wondering, what are the stories behind the fabrics? Were these dresses that had worn out, shirts, children's clothing? Look at the bright colors. Who was supposed to get this if it ever got finished? Who actually worked on it? Why did my grandmother whom I don't remember even darning socks, wind up with these hexagons? Where did they work on it? Why was it abandoned? We have no clue. Now, here's the next question, how do I finish this? I'm no quilter. I can sew but quilting, if it's small, like the cat banner, that's one thing. I can pseudo-quilt. But this is a whole top. There are 44 large hexagons. I didn't lay them out on my bed, but I'm thinking there was to be yet another border between them, that they were to be separated one from the other. Maybe not but that's my current theory. That would be enough to make a queen-size quilt. How do I even begin to finish this? In a case of sheer co-inky-dink, one of the blogs I read, Michele Made Me, has the blogger making wee hexagons for her own quilt. Check out the July post with how far she's gone and then, if you're curious as to the progress, click the links to go backwards. Somewhere I posted a bit of encouragement, something to the effect that I truly admired her for doing this because I never could. Well, as Popeye would say, "Blow me down". 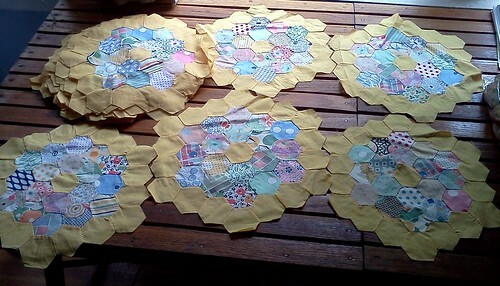 I'm the proud owner of 44 giant hexagons in need of a quilt. For the moment, I've put them all back in the bag mom had them in and put them in a box which will be the "unfinished projects" box. This is not a project I will start this year. I am drawn to finishing it, however. Perhaps I could attach these to large pieces of fabric? I'm not sure. I just know I want to finally finish what was started so many years ago. I handle the pieces and feel such a connection to people I never knew and to the few I did. I want to honor their memory with the finished project.